Scholarships in Australia for International Students – Students aspiring to study in Australia usually look for prestigious scholarships to fund their education. Australia has been a huge attraction for students from around the world to pursue a variety of courses. The beautiful and peaceful environment, high quality education and the amount of post-education career opportunities are some of the reasons why Australia is popular amongst international students. Australia is also home to seven universities in the top 100 according to QS World rankings 2018. A number of scholarships are offered for international students in Australia. Applications for scholarships usually require applying within a stipulated date along with a motivation letter justifying your reason as to why you are eligible for a scholarship. Some scholarships, however do not require any application and all the applicants equally eligible. Two kinds of scholarships are available for international students interested in pursuing education at the top Australian universities. The Endeavour Leadership program is a scholarship in Australia sponsored by the Australian government for emerging leaders. It is available for international candidates pursuing various types of academic activities in Australia including postgraduate education, short-term research, vocational training courses and professional training. Eligibility: In order to be eligible to apply for the Endeavour Leadership Program, the applicant must be a citizen of a participating country and must be at least 18 years of age. Additionally, the applicant must commence the mentioned program of study in Australia in the following academic session after application and must not already be enrolled in a program. Applicants who have previously received Australian government funding are not eligible for this program. Travel allowance up to AUD $3,000. Monthly stipend of AUD $3,000 for living expenses. Establishment allowance of around AUD $2,000-4,000. Health insurance for the entire duration of study in Australia. Travel insurance for the duration of study in Australia. The tuition fee contribution is dependent on the academic activity which the candidate is planning to carry out in Australia. Application Period: Applications for the Endeavour Leadership Program 2019 will open in September 2018. The Australia Awards are funded by the Australian Department of Foreign Affairs and Trade and comprises short terms courses, scholarships and fellowships for candidates from over 60 different developing nations around the world. The Australia Awards scholarship is for students who want to carry out research or study in Australia at any of the participating Australian universities. Eligibility: Candidate must be a citizen of one of the participating countries and must be aiming towards postgraduate or undergraduate education in Australia in the following academic session after application. Other specific details vary with the country of citizenship. Full tuition fee coverage for the program of study in Australia. Return air travel from the city of study in Australia. Establishment allowance of AUD $5,000. Living expense contribution up to AUD $30,000 per year. Health insurance for the duration of study in Australia. Pre-course English fees (if necessary). Introductory academic program of 4-6 weeks in duration. Additionally, the scholarship also provides options for supplementary academic support and fieldwork opportunities in Australia. The Australian Government Research Training Program is for prospective masters by research and doctorate students and has replaced the IPRS government funded scholarship in Australia. The AGRTP scholarship is funded by the Australian government and enables international students to pursue a postgraduate research qualification as well as gain valuable experience with some of the best Australian researchers. Eligibility: In order to applicable to apply for this scholarship in Australia, the applicant must be an international citizen of any country except New Zealand and must be seeking education in the form of a 2 year masters by research program or a 3 year research doctorate degree. The candidate must also satisfy the individual university eligibility/selection criteria in order to be eligible for the AGRTP scholarship. Scholarship Benefits: This scholarship covers the applicant’s full tuition fees for up to 3 years (with a possible 6 month extension) as well as health insurance for the total duration of study in Australia. Additionally, the scholarship covers the the health insurance and costs for any dependents that the applicant has for the duration of the program. 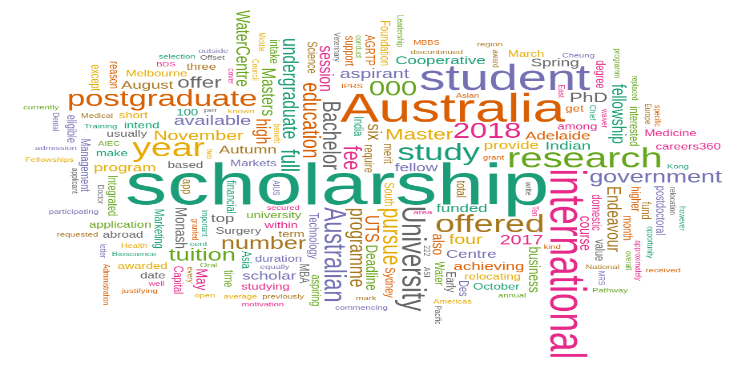 Apart from government funded scholarships, each Australian university offers university specific scholarships for international and domestic applicants. These scholarships are either program-specific or university-wide and candidates are selected for these scholarships according to varying selection criteria. Some university scholarships in Australia require the applicants to submit a a written application or document stating why the scholarship should be awarded to the candidate in question whereas others are often merit based. Some of the university-specific scholarships in Australia are listed below. The University of Adelaide offers the Adelaide International Undergraduate Scholarships for prospective undergraduate international students from any nation except New Zealand. This scholarship provides the student with a 25% reduction in tuition fees for up to 4 years during education in Australia. Around 40 scholarships are awarded each year and are open to all undergraduate programs except in the domains of medicine, dentistry and veterinary science. This scholarship offers approximately 300 high achieving scholars (domestic and international) an opportunity to study in Australia at The University of Melbourne. The students can pursue either a masters by research or a PhD degree. The scholarship provides full tuition fee coverage for the students i.e. two years for masters by research and up to four years for PhD. Also offered is a relocation grant of $ 2000 for students relocating within Australia and $3000 for students relocating from outside. This scholarship offers undergraduate and postgraduate aspirants the opportunity to pursue any program except Bachelor of Medical Science and Doctor of Medicine or Master of Business Administration (MBA) as well as Monash Pathway programs for study in Australia. A total of four scholars are awarded a full tuition coverage for the duration of their education in Australia. This scholarship is offered to students who have received an admission offer for a full time program from Monash University. This scholarship is offered by the University of Technology Sydney and is for prospective postgraduate students who plan on pursuing education in Australia. The scholarship includes full tuition coverage for six scholars and will be offered to high achieving students who have secured an overall average of 90% marks in the past years of tertiary education. The Global Leaders Scholarship in Australia offers Indian students pursuing postgraduate business education in a number of programs including MBA, Master of Finance, Commerce, Professional Accounting and more. The aspirants should also have an excellent academic background, i.e. a minimum score of 70% from a top institution. The scholarship is awarded to 5 students and has a total value of AUD $10,000 which is paid in the first semester.